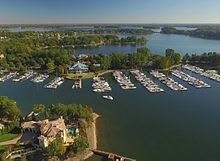 ﻿Lake Norman is nicknamed North Carolina's “Inland Sea” thanks to 520 miles of shoreline and a surface area of more than 32,475 acres in parts of four counties. The largest man-made lake in our state, it came into existence when Duke Energy began building Cowan's Ford Dam in 1959 on the Catawba River Chain. Lake Norman is nearly as large as the other 10 lakes on the Catawba combined. Our Inland Sea features plenty of outdoor fun and recreation such as fishing, boating, skiing, paddle and wake-boarding, swimming, biking, and hiking trails. Lake Norman experiences also include vibrant sunsets, dining on the waterfront, cruises, regattas, and of course - possible sightings of Normie, the Lake Norman Monster!